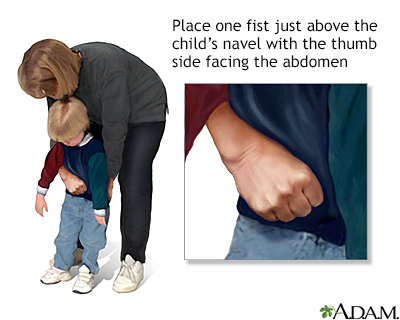 Abdominal thrusts is an emergency technique to help clear someone's airway. The procedure is done on someone who is choking and also conscious. 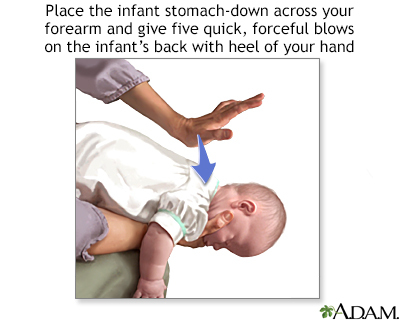 Most experts do not recommend abdominal thrusts for infants less than 1 year old. You can also perform the maneuver yourself. First ask, "Are you choking? Can you speak?" DO NOT perform first aid if the person is coughing forcefully and is able to speak. A strong cough can often dislodge the object. If the person is sitting or standing, position yourself behind the person and reach your arms around his or her waist. For a child, you may have to kneel. Place your fist, thumb side in, just above the person's navel (belly button). Make quick, upward and inward thrusts with your fist. If the person is lying on his or her back, straddle the person facing the head. Push your grasped fist upward and inward in a movement similar to the one above. You may need to repeat the procedure several times before the object is dislodged. If repeated attempts do not free the airway, call 911. If the person loses consciousness, start CPR. If you are not comfortable performing abdominal thrusts, you can perform back blows instead on a person who is choking. Thomas SH, Goodloe JM. Foreign bodies. In: Marx JA, Hockberger RS, Walls RM, eds. Rosen's Emergency Medicine: Concepts and Clinical Practice. 8th ed. Philadelphia, PA: Elsevier Saunders; 2014:chap 60. Choking is fairly common. Choking deaths occur most commonly in children less than 3 years old and in senior citizens, but can occur at any age. 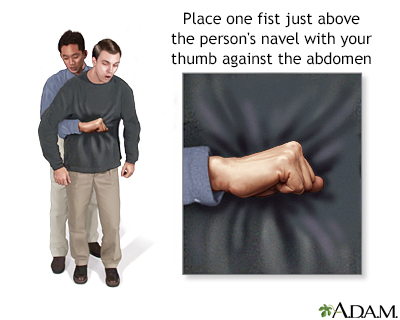 The Heimlich maneuver has been valuable in saving lives and can be administered by anyone who has learned the technique. 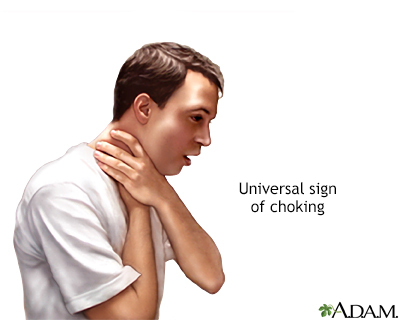 Choking is the hindrance of breathing due to an obstruction of the throat or windpipe. The Heimlich maneuver should be conducted to try to dislodge the object.